What an amazing race! 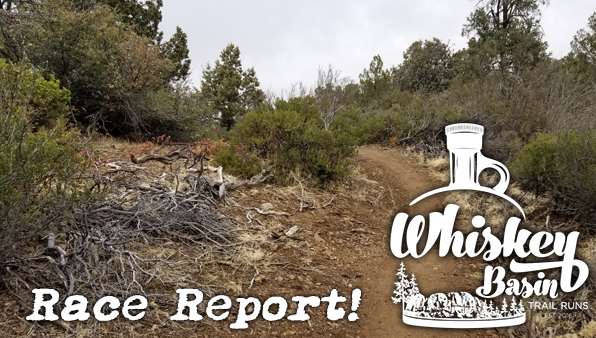 If you have been considering a beautiful trail ultra (or shorter distance), take a moment to check out my 2018 Whiskey Basin 88k Trail Run race report. 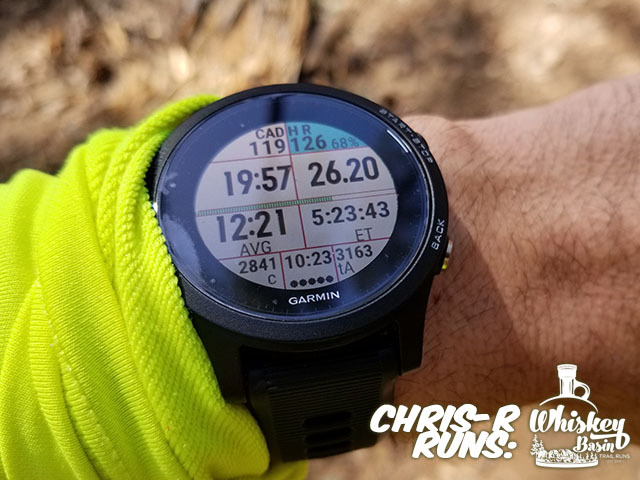 This was my longest race/run to date, and one that was quite a bit different, in a few ways. If you have ran this event, or have questions, please don’t hesitate to use the comments section to give me some feedback, or questions. I have a great manager, who allowed me to get out of work early on Friday. This gave me time to make it to The Hike Shack to pick up my race bib, and commemorative shirt. We got there a little after it opened, which is when so many people go there. It was a little bit of a wait to get us through the line, but not bad at all. Was nice to see so many of the Prescott Area Trail Runners group in line, as well. Gave us a chance to chat some, while being herded through the store. 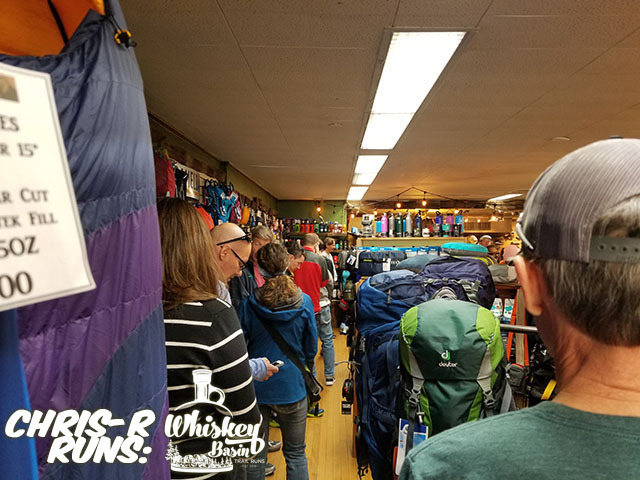 There is something to be said about having at least a modicum of an idea of what one may need to do, in order to prepare for their first (or next) 50+ mile trail race. Now that the race is over, I know what I could have gone without, and what I could have used more of. 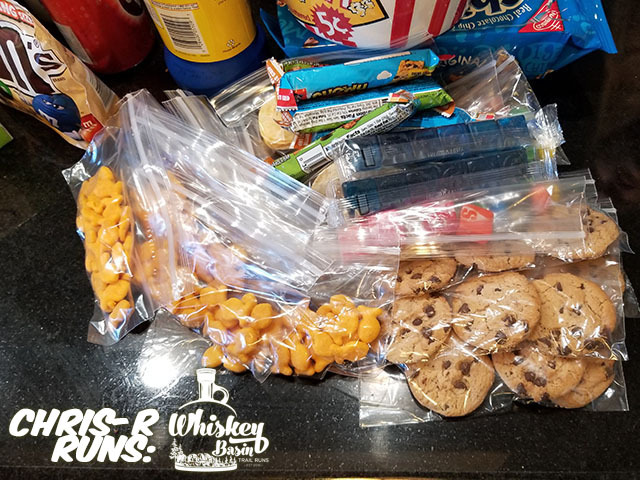 Preparing the night before, I bagged up the snacks I wanted for each drop bag, and made sure I knew which bag would be at which aid station. What I forgot to do, was somehow mark the bags with my name, bib number, anything. Fortunately for me, the bags were unique enough that there were no issues. Double, and triple-checking that I had everything I would need for the next morning, I was confident enough to go to sleep. Waking up extremely early was not the best feeling in the world, not as bad as one could expect though. Making a peanut butter & jelly sandwich for breakfast gave me another opportunity to go over my checklist of things I would need for the day. I did not get hit with any feelings of nervousness, or apprehension until I saw Dan’s headlights at the front gate. I unplugged my phone, grabbed all of my gear & out the door I went. We arrived at Watson Lake Park with plenty of time to spare. That’s when I realized I forgot my phone at the house. We made a quick trip back, I ran to the kitchen, and saw it sitting right where it was when I unplugged it. Hopefully this was not a foreshadowing of the day. It only took a few minutes to drop off drop bags in their designated spots, then I chatted with some other runners waiting for our start. 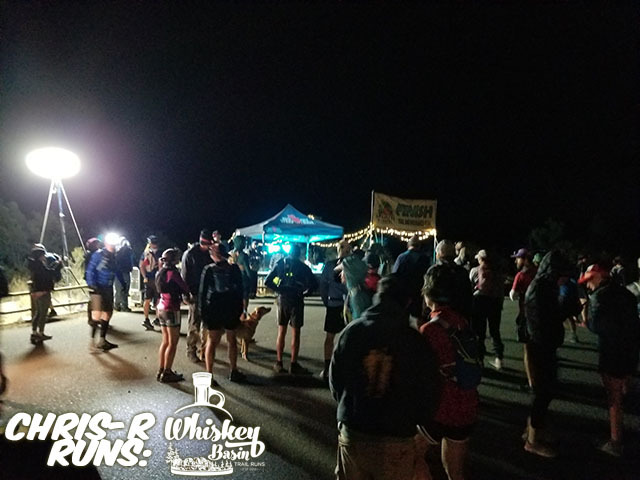 At 5:00am, the race started, and 80-something current & potential ultra runners took off on the start of our Whiskey Basin 88k Trail Run. One runner yelled out, “I make poor life choices” as we began, I did concur! For the first few miles I was running with Noel, which was nice, as we kept the pace pretty easy & joked around some. It was also beneficial, as my headlamp either needs new batteries, or is junk. Hoping for the former, as it was expensive, and a good brand. The sun began to rise as we were passing getting ready to turn away from Watson Lake, giving some amazing reflections in the water. I was not quite at the point of wanting to start taking photos, as the desire to keep going, without dropping my phone was strong. Before long, the urge to capture some of the early moments in the race took over. Knowing it was going to be an almost entirely cloudless day was a little bit of a concern. On a positive note, the wind did die down from the 30-50 mph gusts we had earlier in the week. Emerging from the tunnel below Willow Creek Rd, we started the climb up to and through the Embry-Riddle Aeronautical University campus, with enough light to turn off & remove the weak headlamp I had been wearing. After making it through this section, Pioneer Park & the trails North of Pioneer Parkway, we dipped down to the Pioneer Parkway / Williamson Valley Road intersection. With the aid of local law enforcement, we were able to safely cross the busy intersection. 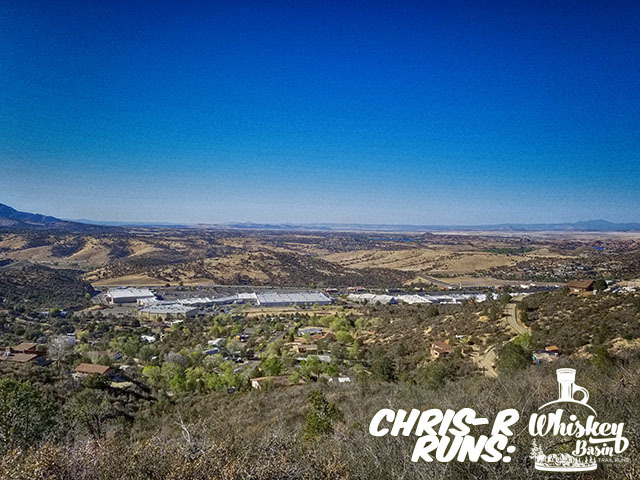 Next up was a section of the Prescott Circle Trail running along Williamson Valley Road, before turning into a neighborhood, up Katahn, and re-entering the dirt portion of the loop, on 341. This was around 10-11 miles in, and I was feeling good, remembering to take some nutrition as footing allowed. 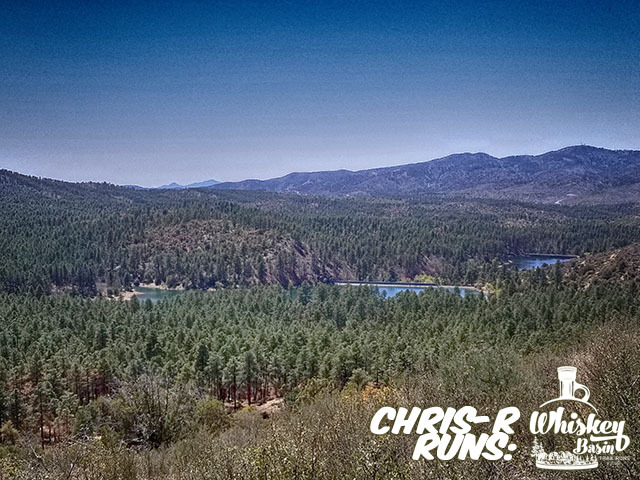 We started to gain elevation & scenery, as we entered one of the forested sections of the race. 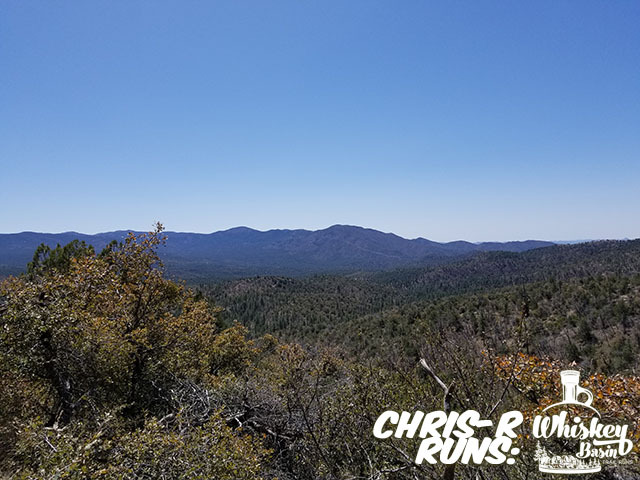 It kept the temperatures cool, while giving some great views during this Granite Basin section of the Prescott Circle Trail. A few miles later, we were greeted by the Iron Springs Aid Station. I made a quick stop at my drop bag, to grab some more bacon, seriously, who wouldn’t have? This was also a good point to get some temporary relief, as I cleared my nose for the first of many times throughout the day. If you have the joys of a nose that runs better than your legs, it can be quite a challenge to regulate breathing, while trying to keep from having too many issues. 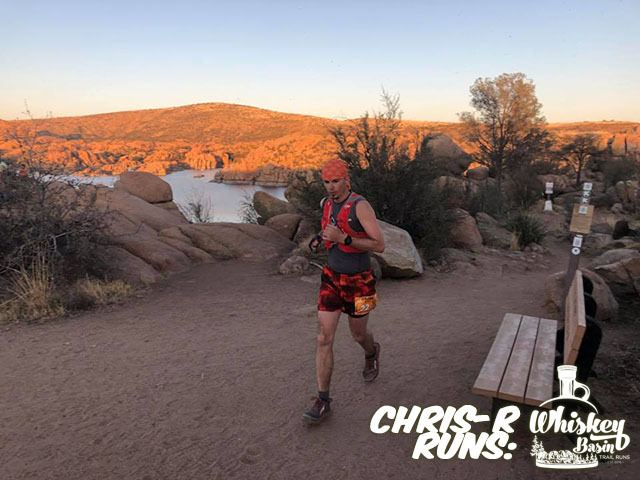 I was feeling much better at this point, than when the Aravaipa Running crew, lead by Jamil Coury, made time to give us a guided training run along this section of course. Sometimes, it is detrimental to know what lies ahead, other times, it is very, very nice to know what is coming up. While the photo makes it seem like I am not doing well, or angry, it is more calm & ready for more. The next section of course was a well groomed dirt road, before transitioning to a bit more of a rugged Jeep trail. 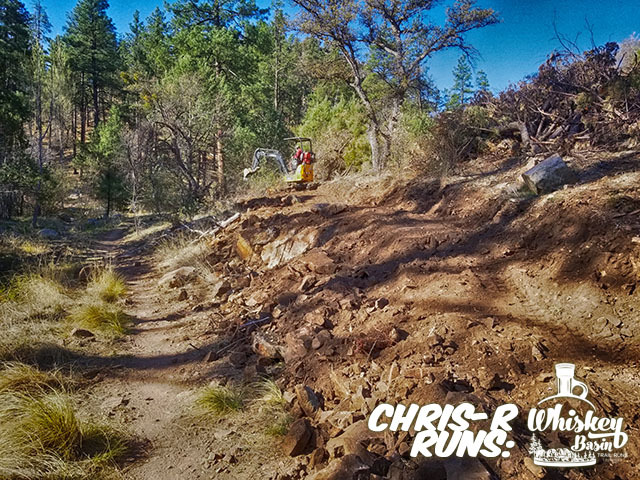 Trail 332: Javelina is a fun one, with some freshly revitalized sections. When running through here a week ago, the tractor was sitting there, dormant. Felt a little out of place to see it in operation during the race. 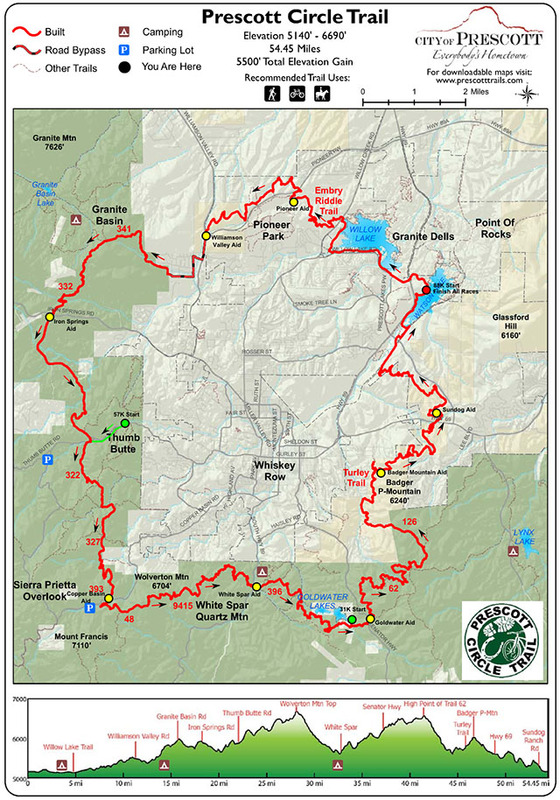 It seemed so quick, before I realized it, I had crossed 26.2 miles of the Prescott Circle Trail system. 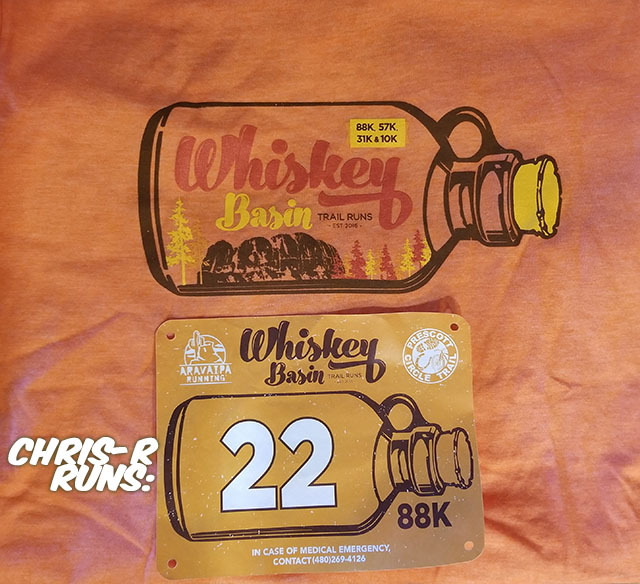 Being that the Whiskey Basin 88k is advertised at approx. 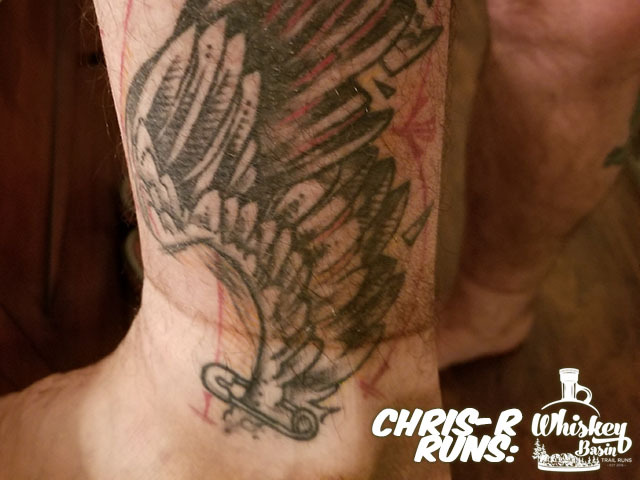 54.45 miles – I was almost halfway done. Except, we knew the mileage was going to be a bit more than that. I was feeling great by this point, still being able to take nutrition in, which has historically been an issue for me. 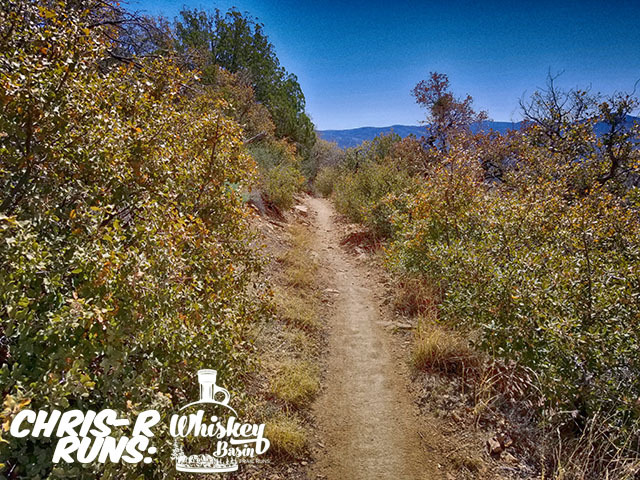 Throughout the morning, and recent runs, my left ankle was reminding me of the third Whiskey Basin 88k training run. I rolled it as we ran along Turley Trail. Not a bad enough roll to need to stop, or slow down, as most don’t. It was just a lingering, “hello, I’m here” kind of irritation. My right quad was giving me some annoyance, just above the knee, at times, too. The course was about to cross over Copper Basin Rd, it seemed odd to me to feel so good, knowing I had already ran a marathon, and had more than a marathon left. More on this later. The trails were surrounded by more scrub than forest for a little bit, allowing us to see some amazing views. Previously, my longest run ever was the Calico Racing ET Moonlight Madness 51k. The final five miles of that race were split between excruciating, and tolerable. During the Whiskey Basin 88k at the 51k mark, I was feeling good. From this point on, every step I took was the furthest I had ever done in a single go. At this point, I was a little off my goal pace, as I had not trained quite enough for the elevation. My plan to walk the ascents & run the descents was still going. It was just a matter of my ascent walks being a bit slower than I would have liked. 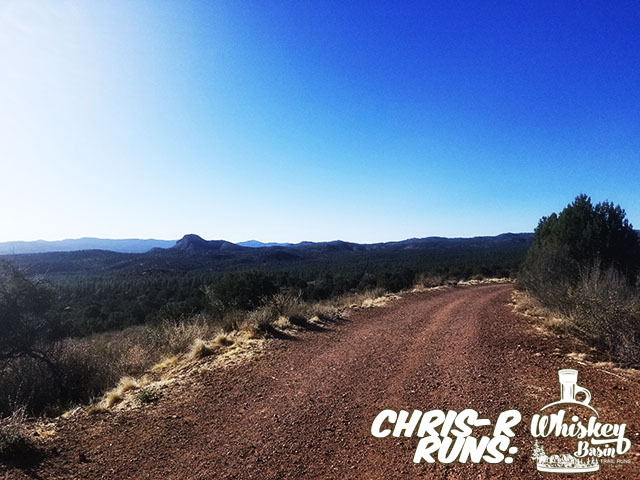 Around this point, I ran into some other Prescott Area Trail runners on the way to White Spar Aid Station. Stanford & Dan (the one that gave me a ride to the race) were right around here. 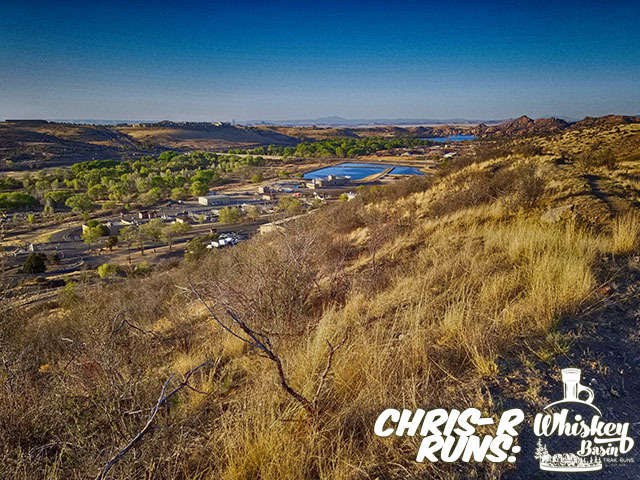 While not having had seized the opportunity to run more of the 300+ miles of Prescott area trails, I have explored a number of them. I started getting the intense feeling of Deja Vu, then it hit me why. During some runs last summer, I found my way to this section of the course. I don’t recall the exact location, and I should have taken the photo when I ran by it. Emerging from the trees, there was an amazing rock formation that I had not ran past before. Anxious to get back out here, find it again & grab some photos. It was a welcome distraction from the run. This was the first stop where I stopped & emptied the rocks & sand from my shoes. It felt nice to take a quick break. This is where I saw Dan for the last time. Turns out he made it only one more mile before his knee issues lead him to drop from the race. 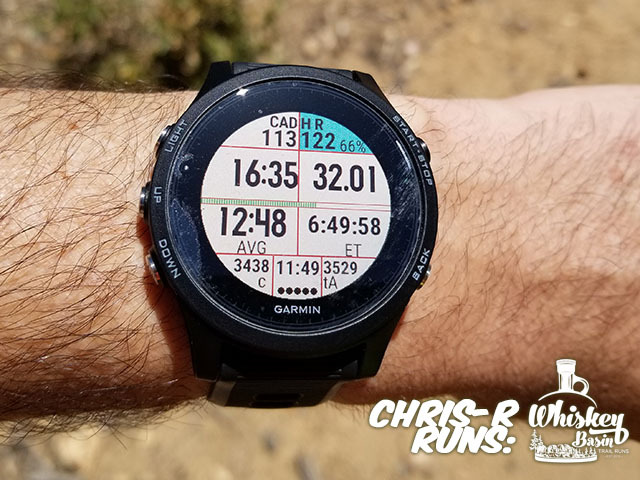 Leaving the aid station, I remembered the last time I was on the trail, doing a couple repeats to get my Garmin to a nice round number. 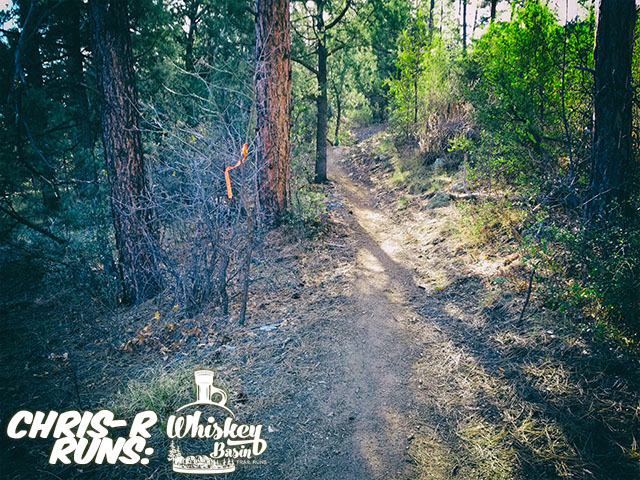 Goldwater Trail 396 is an absolute gem of a trail, nestled in the pines. During this section of the Whiskey Basin 88k, I was getting anxiously excited. My wife, our daughter, my mom, sister, and nephews were going to be at the Goldwater Aid Station. 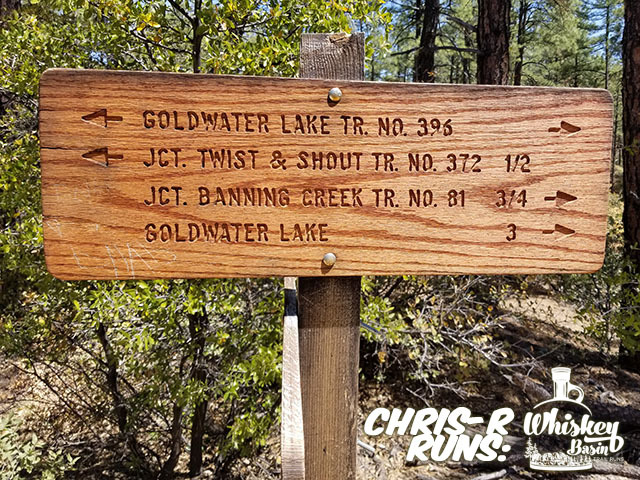 The sign gave me a reason to pick up my feet a little, only three miles to Goldwater Lake, and a single mile from there to the aid station. The volunteer at the Senator Highway road crossing did not get my joke, as I asked if this is where I could get a piggyback ride to the finish. Some of the spectators within ear shot laughed, and directed me to the aid station for further details on the piggyback rides. From across the road, I could hear Embry squealing and screaming, as her mom told her that daddy was here. She always gets so excited when I run to her. 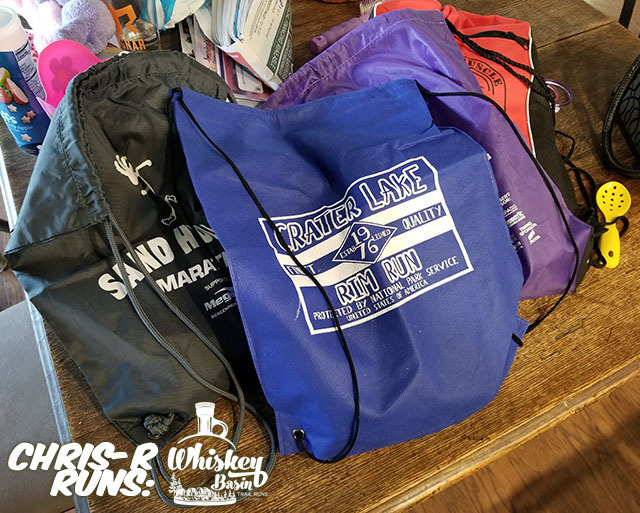 Stopping at my drop bag again, I took a drink of some of my still icy Gatorade, replenished my snacks & chatted with the family for a few minutes. It was a good time to hydrate, rest for a moment, and compose myself for the climb out of the aid station. An aid station volunteer was on top of it, and reminded me that it was probably a good time to re-apply some sunscreen. Good call, sir! 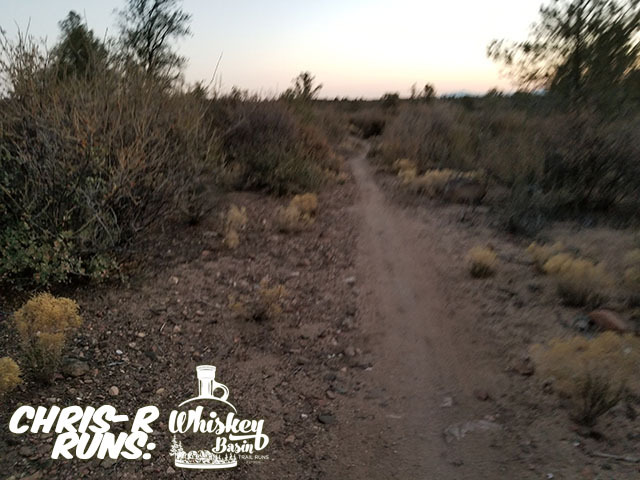 This section of trail is one I first ran solo, then with the Aravaipa Running group, when we did our Whiskey Basin 88k training run. Even on my third time through, I have not tired of the view. Seeing both of the Goldwater Lakes from above is quite a scene. Knowing that a short moment ago, we were a short distance away from the shore is a nice accomplishment. We now were on some of my favorite trails in town. The only bad part was it was pretty warm, and we had almost 10 miles until the next aid station. Climbing along Turley Trail was a lot more difficult than I remember it being, when on fresh legs. I was starting to have more significant leg discomfort, and going through water than expected. Rationing my water, while trying to hurry along to the next aid station was a tough balancing act. I saw Paula continue past me along this section, as I regained myself in some of the spotty trailside shade. With a couple miles until the next aid station, I was out of water. One liter was not enough for me on this warmer, sunny, longer stretch of aidless trail. 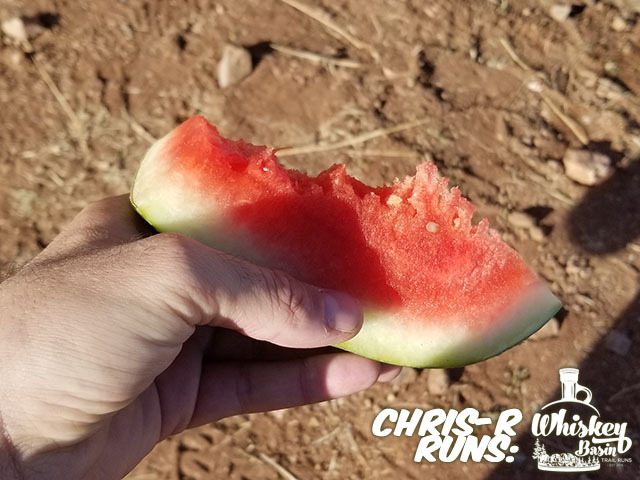 Finally making it to the Squirrel’s Nut Butter sponsored aid station, I sat down to hydrate & replenish my hydration system. Leading up to this point, my legs were starting to make me question continuing. My pace was dropping significantly. The prospect of finishing in the dark was a strong possibility. One lady runner in pink left the aid station as I was arriving. Another runner arrived, and announced he was dropping. Talk about reinforcing that dark whisper in the back of my mind. He also mentioned already having a buckle from the race, which I used as motivation. I wanted my buckle! Back on the trail, I was apprehensive about my chances of finishing in daylight. Using landmarks on the trail, I could tell I was a half mile behind the runner in pink. Then, it happened. My rehydration strategy kicked in & I started moving along at a nice pace. I also realized around this time, all of my leg pains were gone. No more ankle, quad, calf pain, at all. This was amazing. 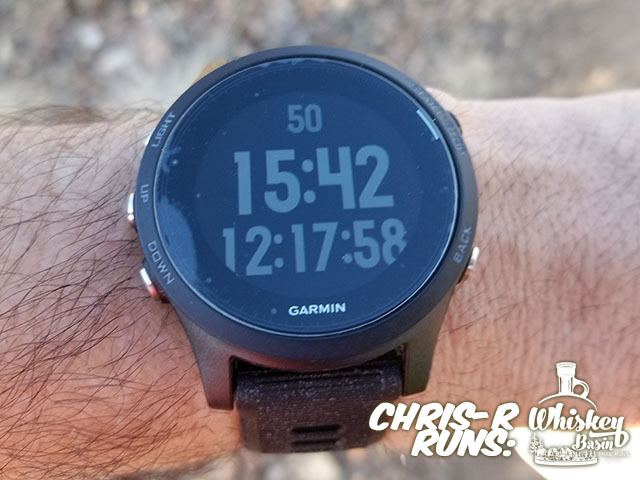 With some nice descents, my watch was displaying some impressive current pace numbers. Soon, the familiar layout of the Frontier Village shopping center was a little to my left. I was already envisioning the rest of the trail. Drop down to the tunnel. Climb up, drop down, climb up, drop down, climb up, and a final drop down. My favorite trail lay ahead. With tired legs, and a sore back, my will was strong, as was the urge to continue. Watching the completed distance on my watch tick closer to a major milestone. Not long after exiting what used to be tagged as the ‘Tunnel of Love’, there it was: 50 miles complete! Just a hair over 12 hours, which means I feel confident aiming for a sub-12 hour 50 miler. 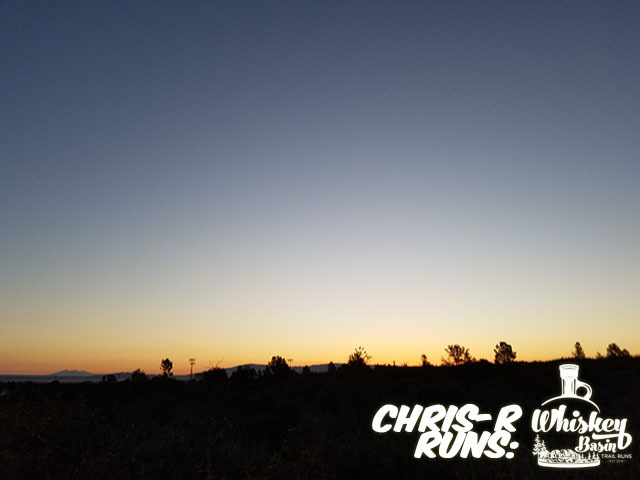 A short stretch later, and I was at the final aid station on Sundog Connector Trail. The amazing team managing this aid station just watched their wife & Mother, respectively, pass through there. I was glad to have their assistance in refilling my water bottles again, and devouring an overripe bit of watermelon. 5.9 miles to go. Not even a 10k. Looking at the horizon, I was confident I could finish before dark. Exiting the aid station, I was feeling good. 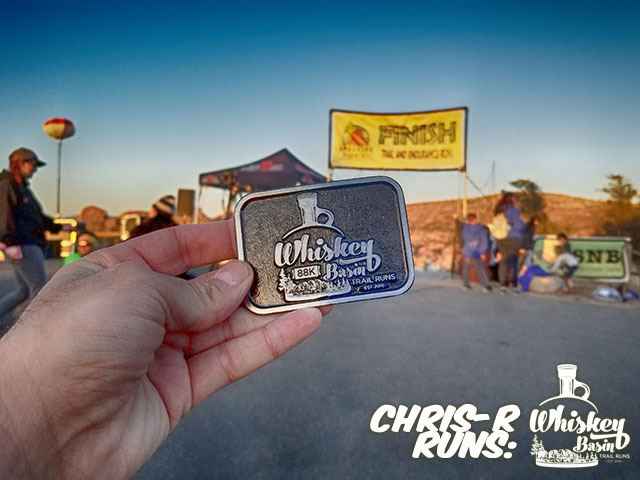 This was such a different sensation than when I willed myself to finish the Desert Dash Blood, Sweat & Beers marathon in 2016. Instead, I was on my feet & started cruising along the trails. Power walking up the hills, overtaking some hikers, leap frogging with another runner, and almost getting ran over by a pair of mountain bike riders, it was an interesting section. Even more so, when the second rider swerved a little to avoid me and snapped his chain in front of me. The descents were feeling almost as good as when I run this section by itself. I could feel some fatigue on the climbs still, which was not unexpected. After the Juvie climb, I came around the hill and was greeted by a view of the last little bit of the race. Wow, my attempt at the Whiskey Basin 88k was about to be more than just an attempt! On the final descent down Sundog Connector Trail, my legs were feeling pretty fresh for small doses. Descending at an almost sub-8 minute mile pace (in spurts) was a sensational feeling. I passed a runner competing in a shorter distance just before crossing Sundog Ranch Road, which was surprising. After the road crossing, I had the second and closest calls for a fall of the day. My right foot caught a rock, sending me flying forward, almost completely uncontrollably. Somehow, I managed to get my feet underneath me & regain a good rhythm. It inspired me to grab one last runfie of the day, as I was grateful for the ability to prevent a fall & having minutes until I was finished. 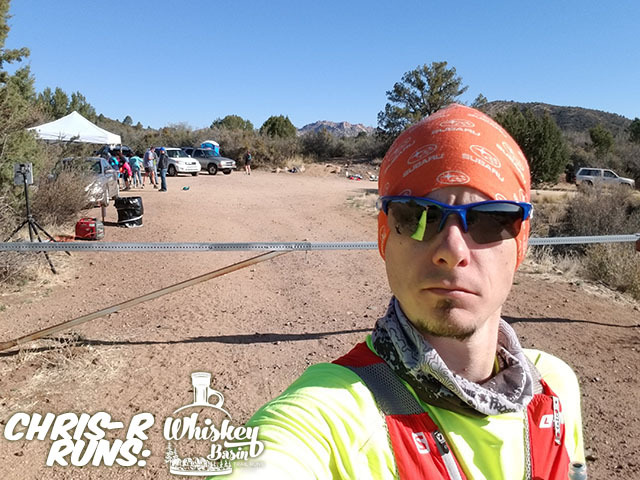 If I showed the two selfies, without notes as to when they were taken, one may think the Iron Springs Aid Station photo was later in the race, with the look on my face there. 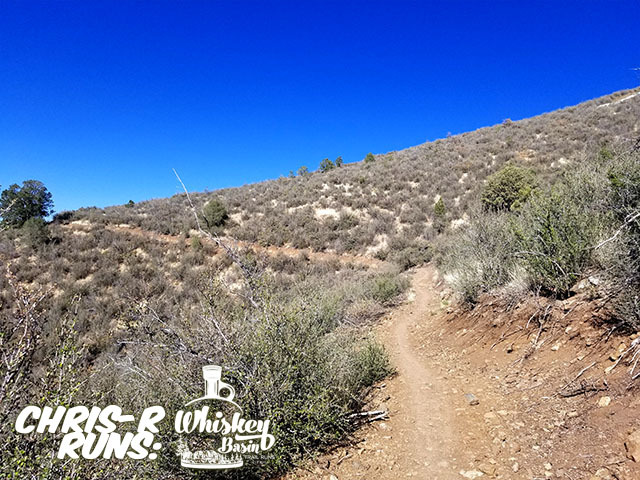 On the straight, flat, boring section between Sundog & Peavine, I managed to fly past some other shorter distance runners. I don’t mention this in a braggart tone, but in a surprising on. I was feeling very good at this point. 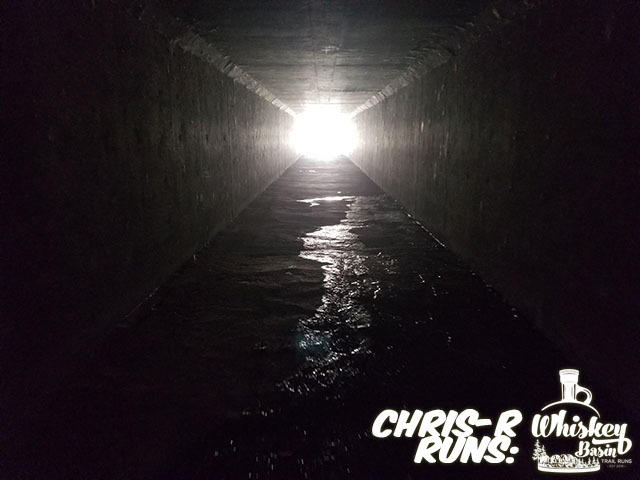 Going under Prescott Lakes Parkway, and making the small ascent to the Peavine Trail, I saw another runner not too far ahead of me. I tried to pick up the pace some to catch up to them, as their bright green shirt was a nice target. As a funny aside, I ran without corrective lenses during the race. Right about where the course took a left turn to go up the western trail along the lake, I thought there was another person on the trail, with a leashed dog. When I reached that point, I laughed at myself. It was a trail sign with race signs behind it, that I thought was a person. Whoever the runner in green was, they were feeling better than me. I was unable to catch them, or even catch a glimpse of them again. Crossing through a launch ramp parking lot to the FINAL stretch of trail, I was extremely relieved to be there. It crossed my mind, maybe I planned finishing at this time on purpose? The scenery across the lake from the finish line were looking amazing in the sunset! A couple more turns & I would be there. Making the last turn, Greg – of the High Altitude Training Institute, and leader of many of our area group runs, was there to cheer & snapped a couple photos as I went past him. How about that?! I had ran 50 & 51k races in the past, however, it was not until this moment that I considered myself an Ultrarunner. 56.26 miles under my belt, according to my Garmin, in just under 13:47. It was a LONG day, a tough day, but well worth it! It was an extremely nice gesture for Steve to get me something fresh to drink as I finished & took a seat. The group of Prescott Area Trail Runners that I get to run with are amazingly nice people. I can’t wait to log more miles with them. With that, my first belt buckle was received, to start a new collection. 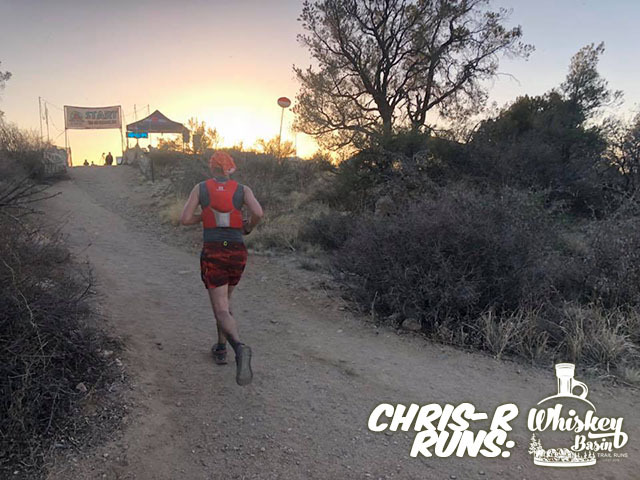 During previous races & tough runs, I have given up running, at the conclusion of that event (and any others already signed up for). While running this race, I stayed positive. This mindset, I believe, helped me run stronger, and better, without the self defeating thoughts absolutely killing my progress & enjoyment. 1 liter of water was not enough to carry during the Goldwater section, for my current level of training. Although I was tired at the end, I still had the thought of running another 3.75 miles to get a 100k in for the day. Am I A Race Addict? 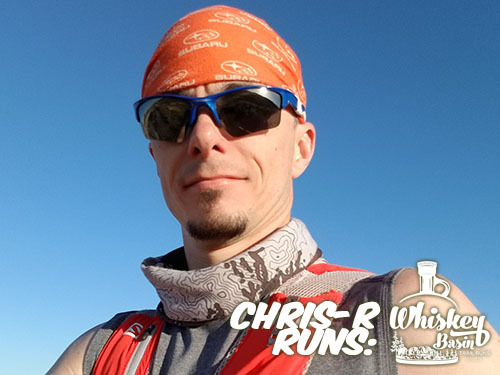 - Chris R.
Revel Mt Charleston Marathon This Weekend - Chris R.